I have a serious fondness for curry dishes. The warmth and the variety of the flavors in both curry powder and garam masala make me very happy. Though I never ate Indian cuisine or curry dishes as a child, curry has become a true comfort food for me in my adult years. 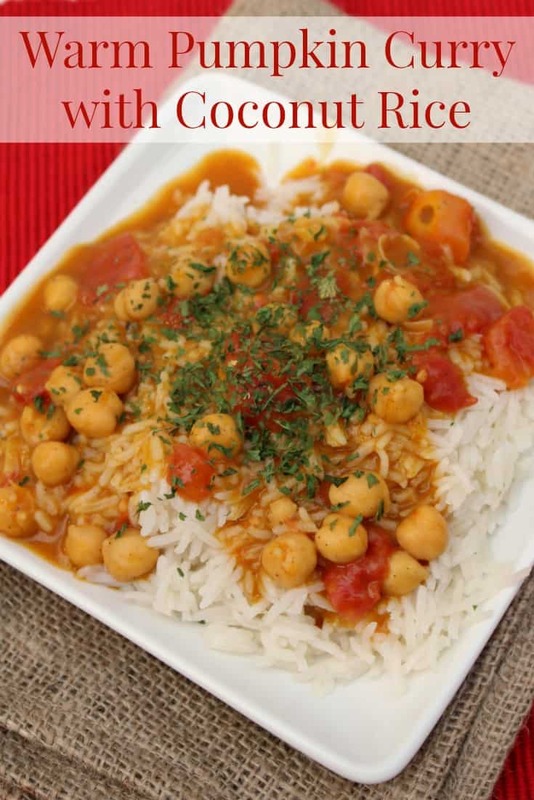 This curry dish is perfect for a cool fall or cold winter night. The scent of curry will warm your home and the flavor and texture of the dish will warm your soul. This curry dish is super easy to make. So simple, in fact, that my youngest son first made this dish when he was 8 years old! The flavor is mild enough that even my oldest, who claims not to like curry dishes, ate it without complaint. 1. Bring the salt and liquid ingredients for the coconut rice to a boil and add the rice. 2. Turn the heat to low and cover the rice while it cooks for 15 minutes. 3. While the rice cooks, combine the ingredients for the pumpkin curry in a large pot. 5. Combine the rice and pumpkin curry in the large pot and serve OR keep them separate and spoon the curry over the rice like a sauce. Note: All of the chicken stock can be replaced with water or vegetable stock if you are following a vegetarian diet or don’t have any healthy, homemade stock on hand. Bring the salt and liquid ingredients for the coconut rice to a boil and add the rice. Turn the heat to low and cover the rice while it cooks for 15 minutes. While the rice cooks, combine the ingredients for the pumpkin curry in a large pot. Combine the rice and pumpkin curry in the large pot and serve OR keep them separate and spoon the curry over the rice like a sauce. All of the chicken stock can be replaced with water or vegetable stock if you are following a vegetarian diet or don't have any healthy, homemade stock on hand.